Wear the best Breast Cancer Awareness Apparel when you wear this eye-catching long sleeve shirt. 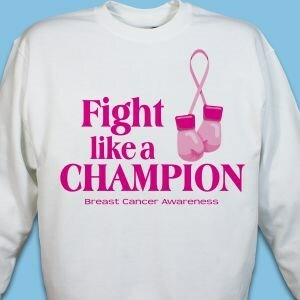 Our Fight Like a Champion Awareness Shirt is perfect for your next awareness event. This Awareness Long Sleeve Shirt for Breast Cancer is available on our white and black 100% cotton long sleeve Shirt, machine washable in sizes youth S-L & adult S-2XL. Additional Info This inspirational design is also available on our Fight Breast Cancer Sweatshirt & our Breast Cancer Awareness Key Chain as well. For more Breast Cancer Awareness Apparel & Walk Gear, always shop MyWalkGear.com.